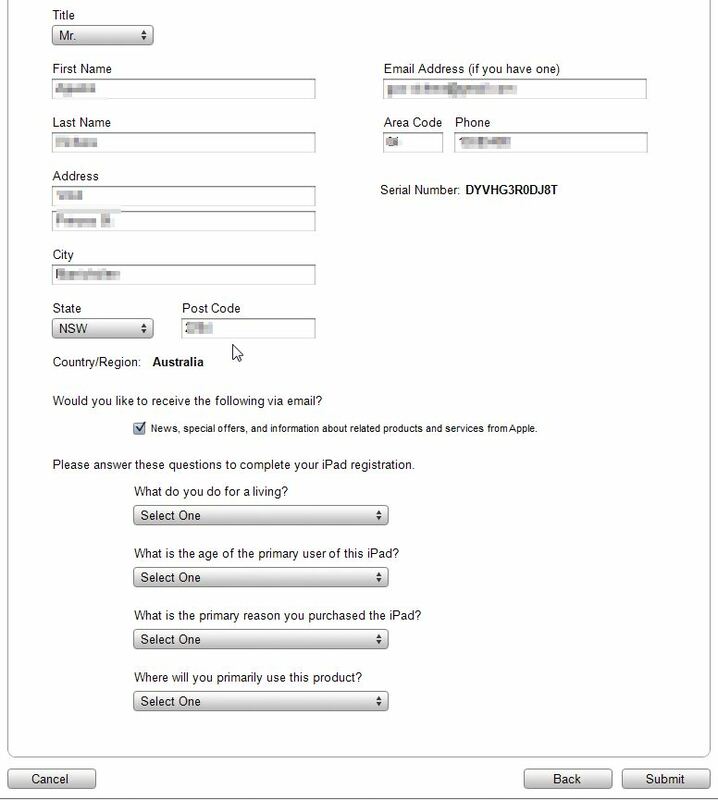 You have a new iPad and you want to restore from a previous backup of an iPad. 2. Plug in your new iPad. Wait for the iPad to appear on the left had side. Mine took a little while to install because the computer has never had this iPad plugged in before. You will know it’s ready when the iPad appears under devices on the left had side of iTunes. See below. 3. Click on continue. 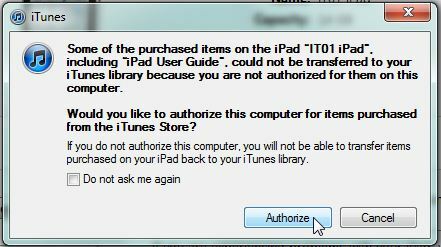 You may then be asked to accept a license agreement, do so and continue. 4. You will be prompted to enter your Apple ID. This will be the username and password you would use when you download apps. After you’ve authenticated you will be presented with the Update Registration details page. 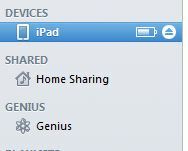 Next step is to ” Set Up Your iPad ” – This is the part that actually restores the iPad from the backup you made earlier. If you have been backing up your iPad regularly, you will have many backups to choose from. 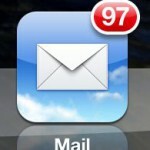 Obviously you will want to restore the most recent backup. 6. Click on “Restore from the backup of: ” and choose the latest backup for your iPad. It will be listed as the name of the device and when selected a date and time will be displayed to give you an indication of which is the latest backup. 7. Click continue and the restore will begin. Mine took around a minute to do. A progress bar will be displayed. 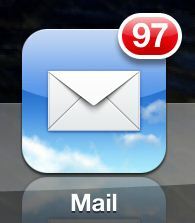 When it completes restoring, a message will appear advising you leave the iPad connected and waiting for the iPad to re-appear in the left side on the screen again. Please wait for this to occur. 8. 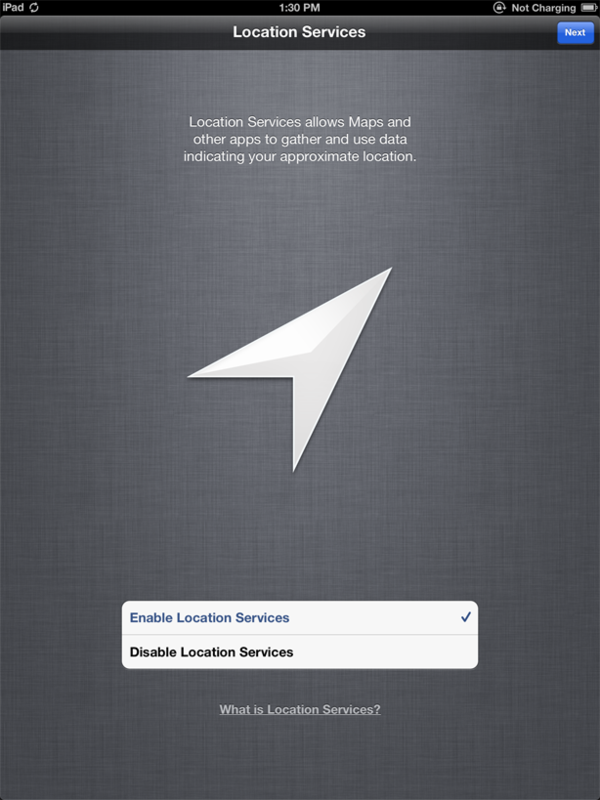 You may be asked to enable location services. If you wish to do so, tap on “Enable Location Services” and then “Next”. 8. The rest of these procedures are done on your new iPad. The first question the iPad will ask is to join a Wi-Fi network. Choose “DanebankGuest” and press Next on the top right. 10. You will know it was successful when a tick appears next to DanebankGuest. 11. The next screen will ask you if you would like to turn dictation on. 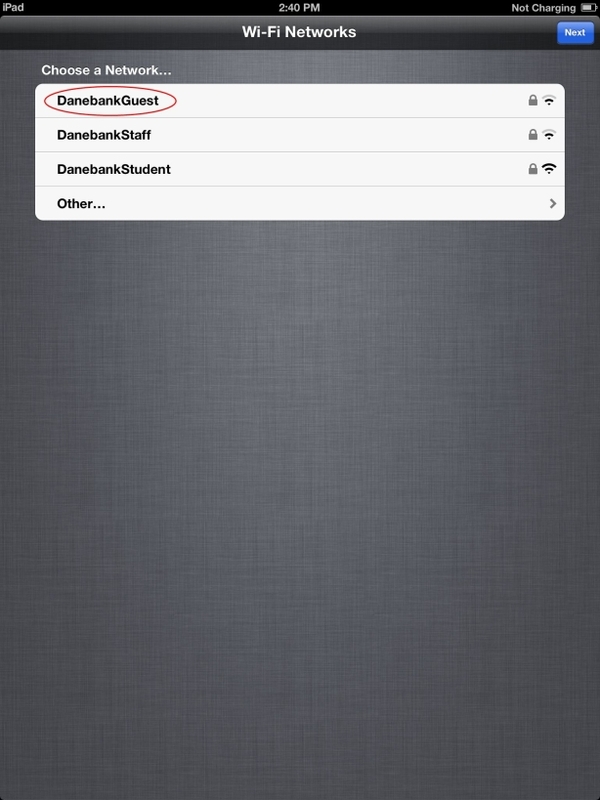 This feature allows you to talk into your iPad and it will try to convert what you say into text. Select if you would like this feature or not and then press “Next” on the top right of the screen. 12. That completes the setup. Press “Start Using iPad” to continue. 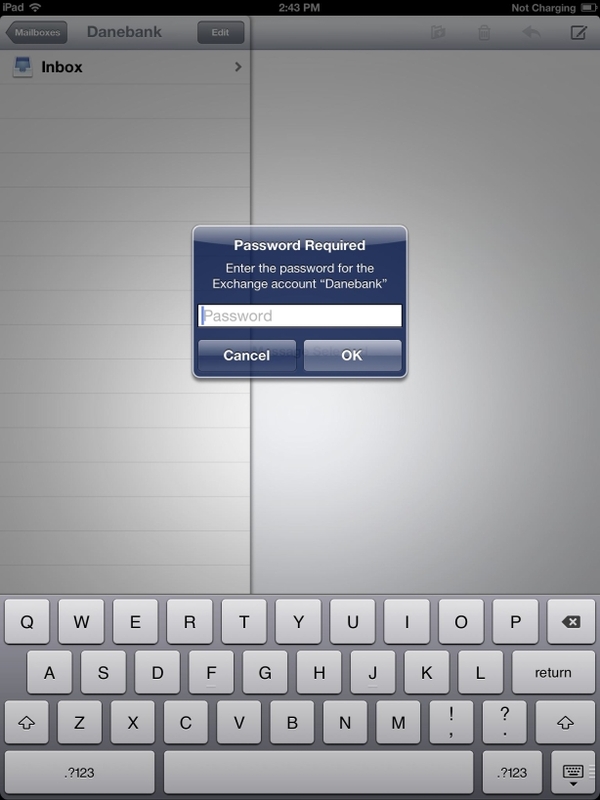 Note: The upgrade will remove all passwords that were entered into your previous iPad. 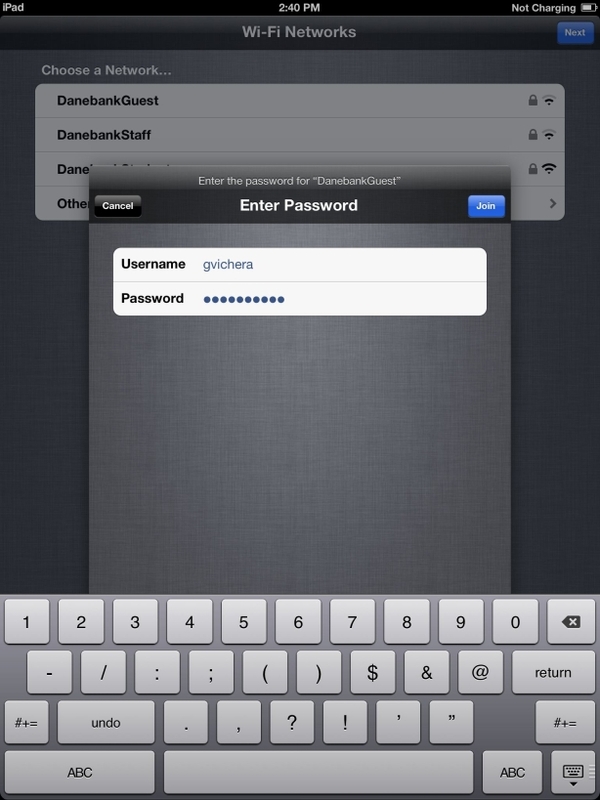 So, please be prepared to enter passwords for any email accounts that you have in your iPad. 13. To re-enter your password for Danebank press the “Mail” button. This message may appear, click on the “Authorize” Button. 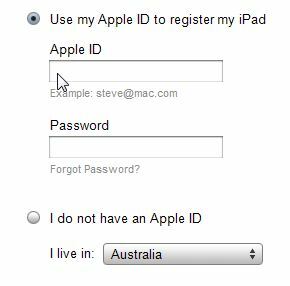 iTunes now needs the account email and password you used to register your Pad. 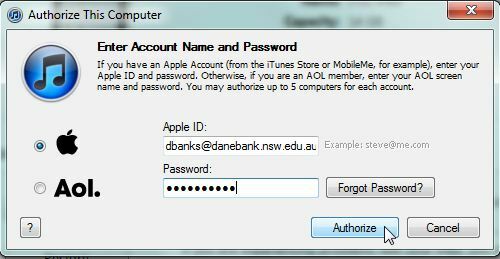 This is not your Danebank username and password you use on the school computers. If you have forgotten your password, you will need to click on “Forgot Password” and follow the instructions. Otherwise, enter your password and click on “Authorize” to continue. Note: It may say “You have authorised 2 computers out of your available 5”. This is normal. This will now begin a process and will show a progress bar at the top of iTunes. See below. Please allow the progress bar to complete before proceeding. 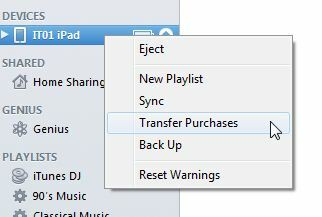 Now you are ready to sync your apps, ibooks, pictures and music into your new iPad.